It is absolutely right for the long-lived Gagliotta shipyard to build boats with the traditional workmanship and sporty aggressiveness typical of Baia-designed boats and yet featuring innovative solutions and swift beauty. The new Camaro Even is the perfect example of this new production line. This open motor yacht has a very well balanced on-deck and belowdeck layout with top quality fittings and components. The boat offers excellent seakeeping performance and maneuverability and reflects the yard's long-lived experience combined with the modern features requested by boaters who are fond of fast open motor yacht. The Camaro Even is a real catch as far as maneuverability, seakeeping ability, trim and performance in all sea conditions are concerned. As a matter of fact all Gagliotta boats are highly performing and competitive. At the end of the sea trials, we felt like having lived moments of pure emotion. Notwithstanding her outstanding seakeeping abilities, the Camaro Even offers excellent habitability and elegant interiors. Good use is made of available spaces and fittings are of high quality and extremely innovative (i.e. simple and practical foldaway table in the cockpit dinette). Draft from lower tip of propellers: 1'8"
Light displacement: 13, 907 lbs. Full boat displacement: 16,445 lbs. Total engines and reduction gears weight: 2,958 lbs. Notes: price with standard power (2x250 hp MCM D Tronic Turbo Diesel stern drive) is Lit. 310,000,000 ex VAT. Superstructures and windows materials: deck fittings are in aluminum, windscreen support is in stainless steel, porthole and windscreen are in Perspex. 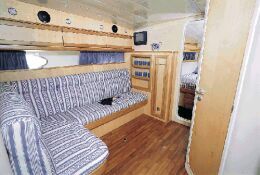 Galley: open galley is to starboard of the companionway, includes several cabinets, cupboards, chest of drawers, worktop, two ceramic hobs, stainless steel sink with cold/hot water mixer, 21-gallon refrigerator, sink top cutting board. 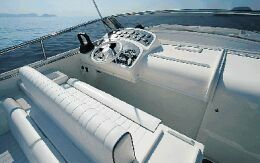 Optional fittings: suede covering, GPS, echo-sounder and log, generating set, auto-pilot, CD player, air conditioning system, boat equipment protecting cover. Seakeeping ability, turning and behavior on waves: we tested the boat with three persons on board, clean hull and full water and fuel tanks. Notwithstanding the high speed, the boat performed very well: she is very stable, maneuverable and has an excellent trim. Hull is configured to minimize vibrations and rolling. Docking maneuverability: excellent and safe, the boat does 360° turns on the same spot. Electrical switchboard and plants: complete and practical.